You are listening to Trinity Employment’s, a player matchmaker podcast starring your host and the cofounder of Trinity Employment Specialists, Cory Minter. Hi, welcome to the a player matchmaker. I’m here with Ethan May. We’re always trying to help other people who are job seekers and employers to be able to become more knowledgeable about finding a job and about seeking for the right employer. So, um, we, we want to thank you for joining us today. The title of this particular podcast is going to be three trends that will shape recruiting in 2019. So this is primarily going to be for um, employers. However, if you’re an employee you’re likely going to be interested in some of these topics and some of the data especially that Ethan’s going to tell us about this particular topic is really important. As a staffing agency Tulsa, we feel like because recruiting is changing quickly, I promise you this, just from the last year, year and a half of recruiting that recruiting in December of 2019 is likely going to be different than what we’re doing currently. What we are doing currently is much, much different from what we were doing last year. Now we’re doing a big chunk of our recruiting, not from recruiting websites but from social media. I would have never thought this a couple of years ago, this was so far off the map a couple of years ago that it’s crazy. And so recruiting trends are changing. They’re reshaping, recruiting. So if you’re a job seeker, you’re going to want to know some of this information. If you are an employer, get ready. These are some things that you’re going to need to look for because right now it’s a big time employees market and things are changing a little bit. Uh, things are switching on, on the employer’s soap. Before we get started, we’d love to ask that you invite or let people that you know about this podcast. Currently we are on Trinity employment.com underneath the career center. However, we’re going to be moving to iTunes or Spotify shortly. And so I’m really excited about that and we’re going to begin to market this quite heavily. So please, please let people that you know of that could benefit from this content. We’d love to help people. We’re not trying to make money off this. We just want to help people. So, uh, let’s go ahead and get into this. On staffing agency Tulsa, we generally start with some tips, some data statistics and Ethan kick us off, man. Sure. So again, today what we’re talking about is just how recruiting is, is going to change and trends that are, that’ll be reshaping it. And um, and it’s super important for hiring managers, companies, recruiters to know, um, especially given some of these stats that we’ve got fit. Small business did a study and said the 42% of people between the ages of 18 and 34 are considering a new job and 20% of people over 35 are considering a new job. That is a huge amount of people looking for a job and considering one. But you know what that says to me though, Ethan, we’re not going after people who are unemployed. No. Yeah, we’re going after people who are currently employed and some of them may be passive candidates like they would be interested in hearing about a new opportunity, but they’re not frustrated enough yet to begin looking now. They might be actively disengaged. We did a podcast about this not long ago, a remarkably high percentage of people, 60% is what we is. What we put on that podcast are actively unengaged. Yeah, holy smokes, but if you are going to be, if you’re a recruiter, you’re no longer going after unemployed individuals. Most likely you’re going after individuals who are currently employed. Hopefully passive. Yeah. I think what unemployment’s down to 2.9% nationwide. I think really it’s low man. Yeah, I was just looking at it. No, I knew it was low, but that’s, yeah, 2.9% when did you read that? That was last Friday, I think. Really? Wow. You have 2.9% and a and so when you think about it, you’re right. Most of these people that we’re going to be looking at aren’t going to be unemployed people. 42% of people over 18 to 34 are considering a new job. I mean, that’s a huge number of people. And so if you’re not following the trends of recruiting, then good luck because you’re, you’re going to be out outpaced and outmatched by other people that are actively recruiting in ways that will be a little more beneficial. Yes. And there’s some really creative ways that you can go about doing that, which we’ll talk about in, in probably this next podcast when we talk about the 10 best websites to use for job searching and staffing agency Tulsa. And we’re going to switch this up a little bit. It’ll be fun. But, but really, you’ve, you’ve, you’ve got to be astute and, and know what’s coming and we’re, we’ll be talking about three of the things here. Um, do you, do you have any other stats for us or do we have some quotes about this? Uh, you know, well, one thing this quotes that out to me is as we were talking and thinking about it simply because I’m a huge green bay packers fan and this is a Vince Lombardi quote who is, you know, the original, that’s great, but Green Bay. Yeah, you get there. Well see, I’m like an intelligent person. So I would say you’re unintelligent. You’re going up until the next one. But can they get that out without laughing? I was just the, yeah, my dad was always a huge packers fan. My Dad says it’s God’s team. They have the g stamped on their helmet and it’s God’s stamp of approval on it. I just can’t believe how unintelligent that state, I know where to go. It was funny. Whatever. Anyway, but no, that wasn’t funny. Let’s go back to it. That was just flat unintelligent buddy. Yeah. So Vince Lombardi has a quote and he says, it’s not whether you get neck, excuse me, it’s not whether you get knocked down, it’s whether you get back up and that’s like a great, you know, football, you know, you know, athlete quote, but it come commit in a way kind of relates to this as well. If you’re not going to continue moving forward as a recruiter or is if you maybe take some some risks and you start recruiting in new ways with these new trends, maybe you might get knocked down. But if you get back up and you keep doing these things that you’re going to see success in the long run and not get left in the dust. And wouldn’t we all like to be motivated by Vince Lombardi? Great. Be something else. Yeah, that’d be really great. Well, um, let’s, let’s go ahead and dive into this. We have three main points, so we’re going to spend a little bit more time with each point. Um, but the very first thing is hiring for soft skills and potential. You know, I went, uh, this was a little while ago. I actually shared this story with you, but I was in an airport and I come across a Harvard Business Review Journal. This was when I recognized how unbelievably, unbelievably expensive journals are. Yeah. You spend like 15 bucks on it. It was just a magazine, but I’d had someone, I’d had someone that was kind of being a mentor to me. He said, you know, you should, you should try to read from this journal about what they’re saying. It’ll tell you a little bit about what’s to come. All right. This particular article, it’s interesting was, um, God had to have been five or six years ago at least. And it, it was when I was, uh, traveling to Washington DC get this, I was going to do a presentation at the White House really? And the only reason we didn’t get to do that is because President Obama did a surprise visit to it, to Afghanistan back then. We were still very involved out there. And, uh, he took half of his office with him when he moves, a lot of people get moving. And so our meeting got moved from the White House to the u s chamber of Commerce, but it was with um, Lee Cockerel who’s vice president of Walt Disney world. I mean it was just an unbelievable opportunity. But then that was when I’d learned, hey listen, I need to start looking at that cause I got to spend a lot of time with Lee. And he was just, he was so brilliant and so simple the way he advised. But one of the things that you saw, I bought that about the article in it started talking about this particular topic. Man, that was a long story to get there. But we were, but we were, it talked about this and, and it was the first time that I’d ever read or even heard about anything like this where listen, big companies that are being smart in recruiting, they are going and hiring for potential or character and they’re going to train the skill and that, that was the whole point is that you’ll do better train the skill with the right person who’s going to stay, who fits into your environment and fits into your culture than you ever will with, um, with just trying to hire for skill. And that, that had been the trend for a long, long time and we saw that as a staffing agency Tulsa. Yeah. Yeah. I mean there’s a quote, I mean we’ve said it before, I can’t remember if it’s by someone or some anonymous quote, but higher character train skill is, I mean, that’s a big trend now and things that people are super looking for. We know something else that’s, that’s really captured my attention and I’m trying, well I’ve talked to our team a little bit about it, but this whole thing of AI, artificial intelligence, we, we are being preached to as recruiters and and in the medical world. Um, you know, we’re, we’re taught, we’re being preached to that Ai is gonna take over everything they are saying customer service is no longer AI is going to take it over. And a lot of the big think tankers or the intellectuals are claiming this, that artificial intelligence is going to take this over. Well this is the reason, I just don’t know how it’s going to happen. With recruiting you, how do you determine soft skills? That’s, that’s a really hard question. I mean there was actually a, a, a linkedin study recently and it said the 92% of people responding to this study, which were recruiters, hiring managers, people like that. 92% of people said to linkedin that they value soft skills as much or more than hard skills upon hire. But while companies agree that soft skills are valuable, most struggled to assess them accurately. I mean, just 41% of these people that were interviewed by Linkedin, they said only 41% have a formal process in place to measure soft skills. And 68% of respondents said that the main way that they judge soft skills is just by observe observation during interviews. I mean that’s, that seems pretty vague though. That’s, it’s a hard, a hard thing to, to really nail down. Well there, there’s, I don’t know how you, um, I don’t know. Uh, create a system for, um, someone’s spirit. Um, and I’m not trying to get spiritual and in any way, but there’s, there’s something called intuition and that is a quote, quote feeling, which can, can often go wrong. But one of the things that we do here at Trinity, I hire people for what I feel their intuition is going to be because I believe that that is the biggest indicator on whether or not we can find someone that fits within the culture of a certain company is intuition. And they’re, you know, many, many times I’ve interviewed someone and there was just something that didn’t sit right. So I’m going to talk a little bit about how to work on this intuition before we move to the next topic. But, but first I want to tell you a reason, you know, an example of how this happened. And I had somebody come in for an interview and man, oh man did this person told me everything I wanted to here told me that there was going to, he had, you know, he was a salesperson. He was going to bring business instantaneously, um, in all of this business was high profitable business. And I was like, oh my gosh, this is almost too good to be true. You know, God, did you just send me, you know, and so I’d gone through this entire thing. And so I went, but there was something in my intuition that was like, something doesn’t add up and quite sit, right? Yeah. And so I started checking his references and the very first reference that I called was, his office was his manager, is what he claimed. And the manager, there was something that I synced. I don’t know how to say it. And I’m not trying to say that I’m extraordinary. I’m not, you guys have it too. Everyone has this. When you sense something is wrong, something’s off, but you can’t pinpoint it. And you know, so I started asking more detailed questions and at the end of it I got her to admit, yeah, I’m his wife, you know, and he’d said his wife up, you know, and later on I’d, I’d found some other interesting things out about that. But the thing is, is there was nothing other than intuition and staffing agency Tulsa. So one of the things that you can do when you have that intuitive, um, you know, questioned is really dig into their references and ask them specific questions and be very, um, uh, very specific with what you asked, but be intentional that I’m really going to do a thorough job on there, on checking the references, right? Yeah. And finishing kind of what you say you love to Kinda hanging. What you ended up finding out was that woman was his wife and not his manager and he had fabricated basically all of his resume, right? Like he, he had none of those contacts that he had talked about or anything like the, the whole thing. And in fact, I had one of my colleagues in the staffing industry call me up about a month and a half, two months later saying, hey, did you extend an offer to this gun? I was like, no. He said, well, he said that you did. And I said, no, I did not found something out that it really concerned me. Well what was it not wasn’t able to really go into it. But this guy had hired him and he said, man, this guy promised all of this stuff and he didn’t deliver on any of it, not just, he’s like, I just wanted your read on it, you know? And I had to be very vague about it, but you know, after I got off that phone conversation I was like, oh my gosh man, we just dodged a bullet. So you know, hiring for soft skills is very important. It’s scary too because there’s that idea of men, you know, I’m going to take a chance on this person cause I, I trust my gut. But maybe their skills aren’t there. It was kind of the opposite of what you do, where you’re like, man, the skills really seem to be there, but I’m not really quite trusting my gut in it, if that makes sense. You know? And, but it can be scary at either way to really take a leap and say, this person may not have those skills, but I’m, I’m willing to to give him a shot and train them from the ground up. Yeah. Well you’re, you’re a result of that here at Trinity and not, there’s not one person that works here that came in as an expert in the staffing industry. So that may be an idiotic move. I don’t know. But I’ll tell you what thankful for, but I can’t, I don’t know if you can tell just by the, just by the conversation that me and Ethan have, the culture here is quite different from whenever you walk into other places. Listen, we’re not perfect, but we have a really great culture here, but I think it’s a byproduct or it’s a result of hiring the right person first and then train the skill. And in trying to refine that skill. So we need to move on to the next one week. Let’s, let’s spend just less time here on these next. And the second one is offering work flexibility. And this is a growing and growing topic. If you go in there and read about how to be effective in recruiting top talent, this is a top thing that you’re going to read on almost anything. Offering work flexibility. I’ve actually been looking at different ways that we can go about doing that. It confuses the fire out of me to be honest with you. It’s uh, I don’t know, maybe it’s just because it’s going so far against the grain of what I’ve experienced in my past as a staffing agency Tulsa. Yeah, sure. I mean, well, you know, if we want to look at people who have been successful in business, Bill Gates is a really good example. Bill Gates, founder of Microsoft has a quote saying the competition to hire the best will increase in the years ahead. Companies that give extra flexibility to their employees will have the edge in this area. Okay. So we know that this exists. One of the things that I’m, I’m, I’m having trouble with as a business owner, just to be very candid and transparent with you, is that, you know, the very first thing that you generally do when you’re stuck in your ways is to say, well, that wouldn’t work with our business model. Well, I’m sure that Bill Gates could have said the same thing. That’s generally when you’re saying that to yourself, that’s generally when you should start asking yourself, is it really? And that’s where I’m at right there. You know, I’ve got some options that were, that I’m looking at to try to create that, but I’m looking at workspace some flexibility on where you can go to work and maybe experience a different environment. Um, you know, what I think they’re talking about is just you can come and work whenever you want. Well that works great. But we serve employers who generally work Monday through Friday, eight to five. So trying to figure out how that works. There might be a way, but it, it’s uncomfortable for me for sure. Yeah, definitely uncomfortable. But, um, yeah, whether it be, I mean, we work with a company now, pretty big company that they have pretty flexible hours. If you want to come in from seven to four instead of eight to five you can do that. And I’ll bet that’s a big selling point is I have used it as a big selling point because it will be crazy thinking about the sure as an employer. But think about it as an employee. I mean, someone’s like, I, I got to drop my kids off and you know, I gotta pick up my kids at school and the longest the daycare goes to is they end right at five o’clock. And so I can’t get there if I get off at five oh well you can come in from seven 30 to four 30 and stating, still pick up the kids on it. Listen, I get it 100%. I would want it myself. It just trying to figure out how to make that happen. Yeah. And do it effectively and still, it’s still keep those same quality of what we do. But, um, listen, it’s a trend. It’s a big time. It’s hard for me. I’m trying to be open and honest with you about it. But it’s something that if, if this is an easier thing for your business, Oh man, consider it, consider it and yeah. Yeah. Let’s, let’s meet one of the next one and then close up here. Um, last one here is trying to, um, is being transparent about pay. It’s really important that you do this. We talked about this when we, um, when we were talking about millennials, um, when we were talking about millennials, if I remember right, the statistic was that 38% of the current workforce is our mill, is our millennials. And this is why I’m saying that because millennials have been sold to their entire life at an extremely aggressive rate. And because of that, it’s not just millennials, it’s our entire society. We have learned to become skeptical and we’ve ha we’ve each experience our own story of having someone promised us something and it not turned out to be what it was. Well, right now, the current, the current hiring industry, um, it is an employee’s market, not an employers. So employers are doing their best to sell the top talent. So when you get sold to Ethan, how do you feel? Not Great. Oh, it’s like what? Yeah. I mean you feel just kind of like why you don’t trust anything. You know, if I, my phone breaks, you know, I go on to get a new phone, the apple store, you know, the, you know, at and t store, whatever it may be, I go in there and I immediately think to myself, okay, trust about 50% of what these people say because I know there’s so much upsale. No you should do this and this and this. When, when so much of that I don’t need and I don’t want. And so I’m already immediately hesitant just walking into that store. And that’s how people feel just in general now. Cause it happens so often in our daily lives. Okay. Employers take note that you should expect for anyone that you extend a job offer to, especially if there’s a commission structure there. If there’s any kind of variances, you need to be very transparent. You need to be very transparent with people on what they should expect to make in five to 10 years if they ask, and you don’t exaggerate this because if you do then and it doesn’t come true, it, it will be very difficult for that person to one stay actively engaged in to stay with your company and right now with our culture and people bail. Yeah, very quickly, especially when they feel like you haven’t been transparent with them. So, um, did you have anything else to add before we get out? Cause I know we went a little bit over. That’s good. I mean just what you said like it’ll be hard for them to trust you. I feel like as well as an employer it’s hard to trust that you’re being open and you’re being honest and you have their best interests at heart. If the very core of what you started your job with and say, hey, how much am I going to make was over exaggerated, you know, it’s hard to build trust that way. Yeah. 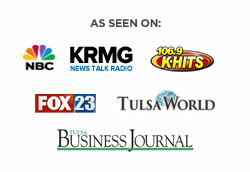 Listen to staffing agency Tulsa, thank you so much for being a part of this podcast. We are grateful for our listeners and so we would like to ask that if, if we can help you at all at Trinity, please give us a call at (918) 622-2588 or if you’d like some information, we’ve got a lot of great information or website, including this podcast. Um, to help people become better at this process. Please go to Trinity employment.com where you can visit our website.